Many datasets today are no longer simple tables, but come in a network structure. For example, social media users who are connected to each other through specific topics, followers, or conversations, or devices that communicate with each other in a sensor network, or transactions in a blockchain network. For these new data types, we have developed a powerful technology that makes it possible to display and analyze even larger networks very user-friendly. Which people, websites or locations in a network have the highest centrality? 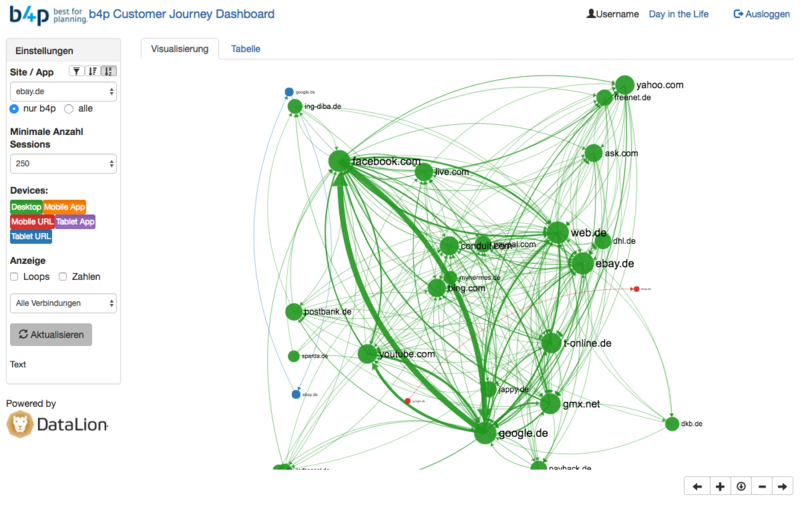 Which nodes of the network have the highest influence? Where are critical nodes that are most important to the cohesion of the network? How does the network structure change over time? For our client GIK, we’ve implemented a web-based analysis and visualization software for technical measurement data of 8,000 people’s Internet usage (desktop, smartphone, tablet) in Germany. Interested in a free demo? Then send us a short message and we’ll set up your test account. For this analysis we used our Social Media software to identify the 1,300 most influential Youtube stars in Germany and trace their links on Twitter. 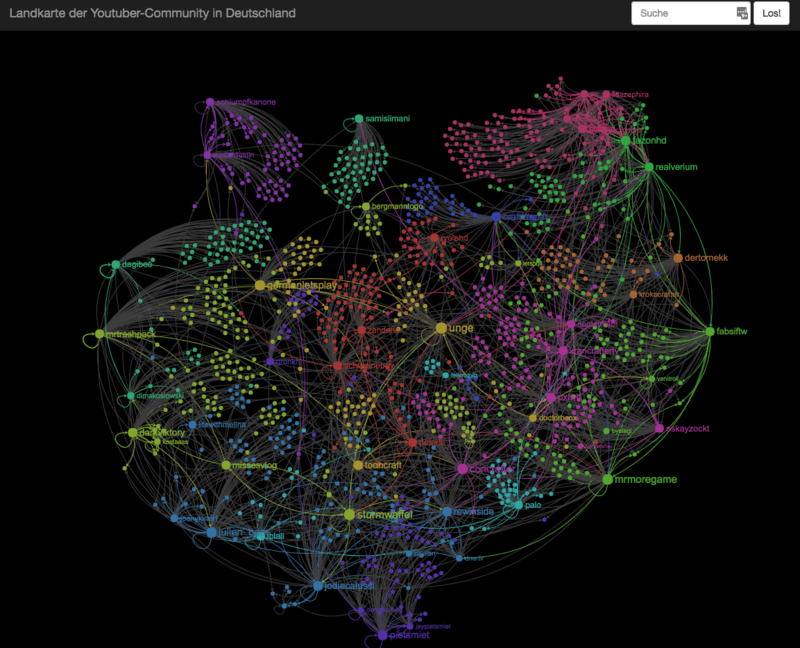 The result is a map of Youtube Germany that immediately shows different thematical or social clusters of Youtube stars. As we are repeating this analysis on a regular basis, it can also be used to identify new shooting stars in Youtube Germany and identify trends. With mouseover, you can also highlight sub-networks and display additional information and figures on each Youtube star. You can visit the live demo right now. 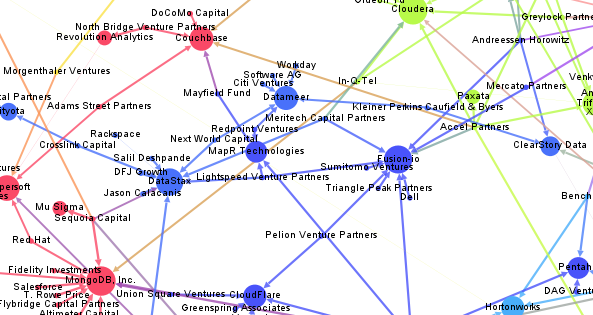 This network visualization links Big Data startups and larger companies and Venture Capital firms by their investments in these companies. This way you can identify investment trends and strategies by the top VC firms in Big Data space – or find out which companies are trending at the moment. More information and a behind the scenes look at the method used here, is on our Beautiful Data blog.